I'll be the first to admit that I'm a huge lover of Tex-Mex and Mexican food. Big time. In fact, the hubby and I can be found at our favorite local Mexican restaurant several times a month. We're a tad bit addicted. I decided to try my hand at some enchiladas. I don't tend to lean towards making them as they can be a wee bit on messy side, but thought I'd try my hand at my own recipe. 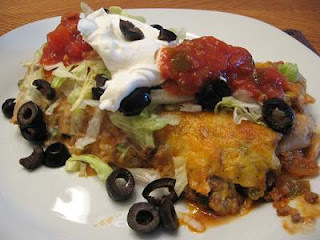 I have featured a previous enchilada recipe on the blog here, but it's been a looooong time; and that one used chicken. So here we go. This is my own version of Beef & Cheese Enchiladas. It may be messy, but you'll forget all about that once you take one bite. I swear it. In a large skillet, blend enchilada sauce with sour cream. Heat through until simmering. In separate skillet, brown meat, adding onion and green pepper. Drain grease and add taco seasoning. Dip tortillas, one at a time, in sauce mixture to cover. Assemble enchiladas in a 9 x 13 inch pan. Place part of the meat mixture on each tortilla; top with a handful of shredded cheese. Roll to enclose the meat mixture and place tortilla, seam side down, into pan. When tortillas are all rolled and placed in pan, pour remaining sauce and any meat mixture leftover on top of enchiladas. Top with shredded lettuce, picante sauce, leftover sour cream, shredded cheese, and olives. I came across this recipe in my email. I'd saved it from somewhere, but just happened to find it again recently! Thank goodness I did! SO good. They're good for either a little breakfast dish or they work really well for a fun appetizer should you be hosting a party anytime soon. Your guests will devour them in seconds! Heat oven to 350 degrees. Lightly grease bottom and sides of 13 X 9 X 2 baking dish. Stir together all ingredients, using either your hands or a spoon. Shape mixture into 1 1/2 inch balls. Place in baking dish. Bake 20-25 minutes or until brown. Immediately remove from the pan and serve warm with your choice of sauce for dipping. I'd like to take a moment to introduce our Guest Chef for the month of February! E Scot Fuller comes to Cooking With Court from the beautiful state of Maine. Scot and I met back in 2000 where we spent 3 fun-filled days together at a Music Education Conference/Convention held in Indiana. I was immediately drawn to his incredibly fun personality and even though we have not seen each other in person since, he remains a good friend. In reconnecting with Scot over the past couple of years, I have discovered he has quite the passion and love for cooking, and has even started his own in-home personal chef/catering business called Newfangled Eats. His culinary creations never cease to amaze me and I knew immediately that he needed to be a guest chef and share some of his masterpieces with you all. You can check out Scot's business website and learn more about him HERE! Thank you, Scot for being such a great friend and for sharing with my readers! I wish you continued success in the future. "Although sausage gravy is often thought of as a traditional southern food, you'll be hard pressed not find it on the menu of any good "Yankee" breakfast dinner. In this recipe, I combine the traditional savory gravy with a touch of sweet maple syrup and delicious herbs baked into a classic country biscuit. You are sure to enjoy!" 2. In a mixing bowl, sift together flour, baking powder, and salt. Mix in fresh chopped herbs. 3. Using your fingers, rub in the butter to the flour mixture until the butter is well incorporated. Add the milk in three parts stirring until a soft dough is formed. 4. Turn dough onto a floured surface and kneed for 30 seconds. Roll dough to 1/2 thickness and cut with a 1 1/2 to 2 inch biscuit cutter. Gather dough and roll again until you have 6-8 biscuits. 5. Place biscuits on the lined baking sheet and bake for 12-15 minutes or until golden brown. While biscuits are baking, start the sausage gravy. 1. Break sausage into small chunks and brown in a large, deep skillet over medium-high heat until evenly brown. Remove sausage from pan using a slotted spoon, leaving the drippings in the pan. 2. Add the butter to the sausage drippings stirring till fully melted. Add flour and stir until smooth. You've just made a roux! 3. Reduce heat to medium and continue to cook roux until light brown. Gradually whisk in milk and cook until thickened. Whisk in maple syrup and season with salt and pepper. Stir in the cooked sausage . 4. Reduce heat to a simmer and cook 12-15 minutes. Taste the gravy and add more salt and pepper to taste. Gravy will continue to thicken. If gravy become too thick, stir in more milk to your liking. 5. For plating, cut 1 herb biscuit in half and ladle sausage gravy on top. Garnish with diced chives or parsley. Serve with Paprika Home Fries. 1. Preheat oven to 450 degrees. Line a baking sheet with parchment paper and spray lighly with non-stick spray. 2. Dice the potatoes into 1/2 inch cubes. Try to make the dice as evenly as possible so that the potatoes cook evenly. 3. in a large mixing bowl, toss the diced potatoes with the remaining ingredients except the pepper. 4. Pour the potatoes onto the lined baking sheet and roast for 30-35 minutues. When pototoes can be easily pierced with a fork, remove from oven and sprinkle with pepper. Pepper is added at the end because it would burn at 450 degrees. 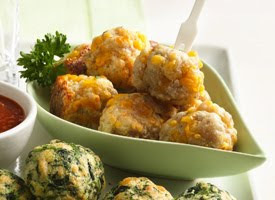 I came across this recipe on Kraft Food's website. 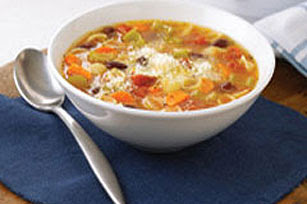 I'd been looking for a great minestrone recipe that seemed simple enough and yummy enough to add a warm touch to a bitterly cold winter's day. I found just that in this recipe. I'm hoping to make it again for an upcoming "luncheon" with friends! Heat dressing in large nonstick skillet on medium-high heat. Add onions, celery and carrots; cook 2 min. or until crisp-tender, stirring occasionally. Spoon into slow cooker. Add tomatoes, beans, broth, water and seasoning; stir. Cover with lid. Stir in macaroni; cook 10 to 15 min. or until macaroni is tender. Sprinkle with cheese just before serving. Become a "Fan"/Follow my "tweets"
Cooking With Court now has its own "fan page" on Facebook! Come join the rest of the blog followers, keep up on the latest, and share your own awesome recipes on our discussion page! Just click on the link below to sign up. Or if facebook isn't your thing, but twitter is, come follow my tweets!! And I'll follow you!